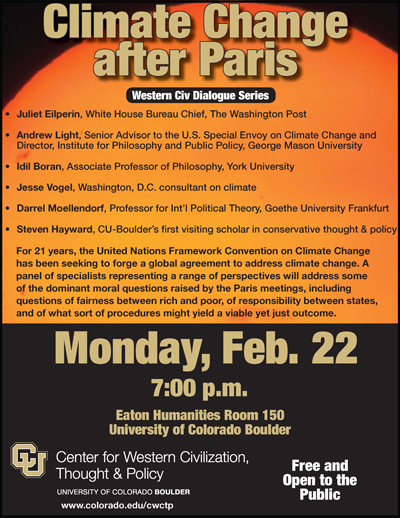 For Boulder area Power Line peeps (and I remember a lot of you from our great meetup in August 2013 at the Bohemian Bier Garden on 13th Street), I’m making a return visit to campus on Monday, to participate in a panel discussion on “Climate Change After Paris.” (Short answer: Same as before Paris. Footnotes to follow.) It will be in Eaton Humanities Room 150. If I’m not too worn out by wrestling with the climatistas, I’ll head over to the Bohemian Bier Garden afterward for a nightcap or four (because what’s a conservative gathering in a mountainous region if it doesn’t include a meeting in the back room of a beer hall?). I’ll try to get this year’s visiting conservative scholar, the estimable Brian Domitrovic, to come along too, but I think he a beer lightweight. But wait, there’s more! If you’re an Orange County Power Line reader, on Friday, March 11, I’ll be the master of ceremonies for the Pacific Research Institute’s annual dinner in honor of Baroness Margaret Thatcher, to be held at the Island Hotel at Newport Beach. It’s a fundraiser for PRI, but well worth it, especially since I’ve instructed this year’s special guest, Jonah Goldberg, to be in extra good form that night. After he gives his remarks, I’ll take the stage to cross examine him, and it promises to get ugly, since I knew Jonah Goldberg before he was Jonah Goldberg. So sign up and come, and I’ll personally sign remaindered copies of Donald Clump’s Art of the Meal.